Description: Hornady 44000 Hornady Lock Rings These steel die lock rings from Hornady clamp around the entire circumference of the die body. The lock screw squeezes the lock ring around the die with constant pressure across the threads - no jam screws. These rings have a flat on each side for wrench use. 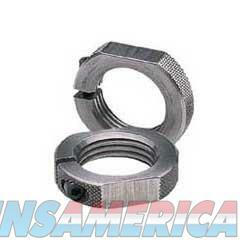 Sure-Lock Rings fit all standard 7/8""-14 reloading dies.